Close to ceiling fixture providing downward and diffused illumination from its hand-blown, glass diffuser. 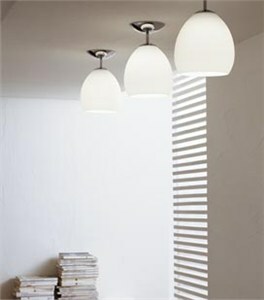 Companion wall, pendant, table and floor lamps also available. 1 x 100 watts, incandescent, A-19, medium base. Stem and backplate: Polished Chrome. Satin Blue, Satin Red, Satin Amber, Satin White and Gloss orange.